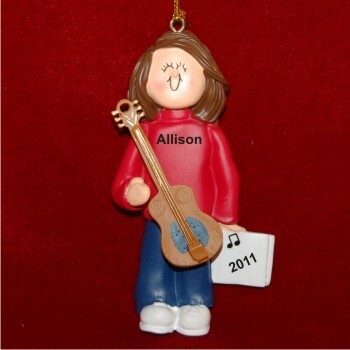 Beginners, pros and players in between love this perky and bright acoustic guitar virtuoso female brown hair personalized Christmas ornament with her name and the year lettered by hand. These handcrafted musical instrument ornaments personalized just for her become cherished keepsakes and are available in several other looks as instruments. Put a smile on her face with the brunette female acoustic guitar player Christmas personalized ornament that arrives in our velvet gift pouch with a golden display cord already attached. Sweet gift Nov 18, 2014 Taylor L.